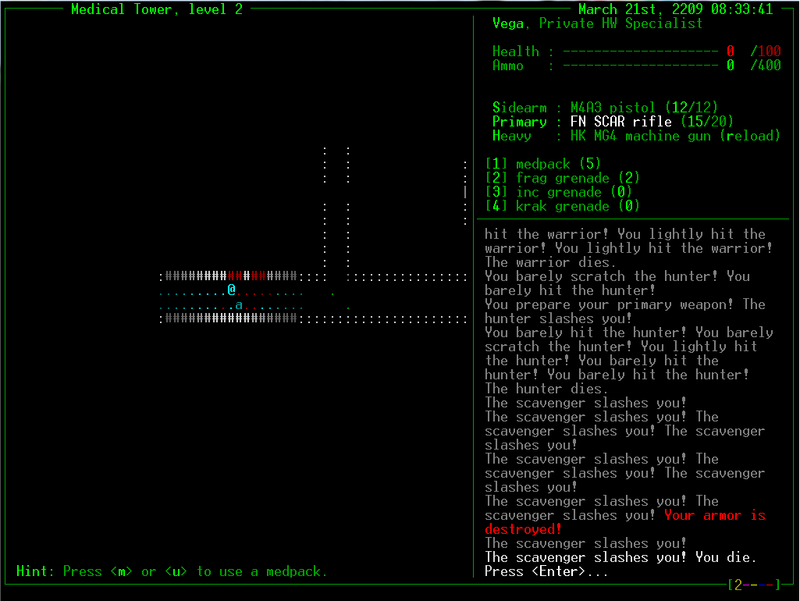 Since my 7DRL this year will be a sci-fi shooter (if I succeed that is), I thought it might be useful to scout out some ideas from existing shooter roguelikes. DoomRL I have already played, so I picked the next best thing; AliensRL. Which is made by the same guy, btw -- Kornel Kisielewicz. I found AliensRL to be quite a similar experience to DoomRL. Though in many ways it's not as deep. I think it has been bit stranded while Doom's development has been going hot. Difficult the game is, however. Tight resource management is a must if you want to get anywhere in as you will quickly run out of ammo. You can -- and should -- avoid many fights by not harassing the worker aliens. Closing doors helps too. But regardless of doing this, eventually I would always be out of ammo and grenades. And as there is no melee attack, it usually meant the end if there was a fast xenomorph around. It doesn't help that all the guns (at least the ones I found) felt really underpowered. Pistols especially seemed totally worthless. I was most successful with the heavy weapons guy. He starts with a machine gun that can at least kill stuff. Until running out of ammo, of course. I wonder if there's some correct order of exploring the map for keeping your character stocked up. I know I for sure couldn't figure it out. With the exception of switching between your weapons -- s, h, and p are not exactly next to each other -- AliensRL handles pretty well. 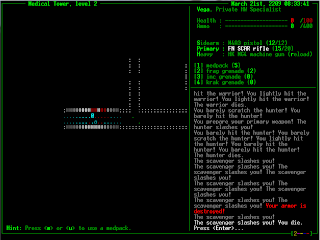 But then again, it's not the most complex of roguelikes. A walkmode for quicker corridor travelling would be handy, though. [edit: And there is such a thing. But who reads whole manuals anyway?] I also wish the game would use a more inspiring palette. And dark blue on black background is definitely the worst combination to use for important stuff, such as non-empty lockers. All in all, I didn't find AliensRL very fun. I think making the guns more powerful would be a nice start. Hey Tanthie if you still want to play this game, we had a strategy thread going on over at Roguetemple.